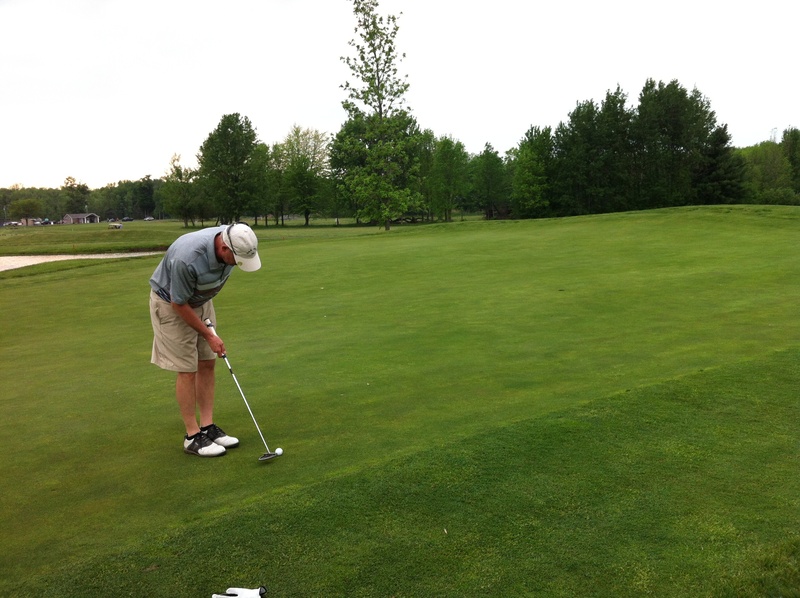 DJ lines up his putt for an eagle on the par-four 15th at Northern Pines in Cicero. Two holes in a row last night at Northern Pines, I hustled to the little black bag tucked inside my golf bag and pulled out my iPhone 4. It was quite the week four for our little informal formal golf league. DJ had returned from his week off to tend to visiting family. We teed off on the back nine, late afternoon gray, but not nearly as ominous as weather forecasters had been warning all day. Big buster DJ took out his driver on the par-four 15th hole because Bird told him to go for it. With a trap 220 yards out, some 60 yards from the green, and a pond lining the left side of the fairway and green, and woods down the right side of the fairway, DJ usually lays up with an iron. Bird thought the wind conditions were right for DJ to let it all out. And, yes. Yes, he did. DJ busted that white-headed Taylor Made driver of his. The ball rode that wind like a happy holiday celebrator on a chute pulled by a power boat. It carved past that trap, landed at the start of the green and rolled to mid-green, right side. Yup. On the par-four in one, eagle putt to come. Dave carefully lined it up. Pin way to the back of the green. Missed. Birdie. Bird looks over his eagle putt on the par-five 16th hole. Next hole, par-five, hole way the hell down the opposite direction from 15. Bird jokes on the tee how he’s never been able to stop his second shot on the crowned green. Bird smotes his drive. Bird stripes his hybrid, as pretty of a second shot as you’ll see on this bear. The ball settles on the front of the crowned green. Bird lines up his eagle putt. Pin also way to the back of the green. The ball just misses wide. Birdie. As a by-the-way, one of my two golfing eagles came here at Northern Pines, at No. 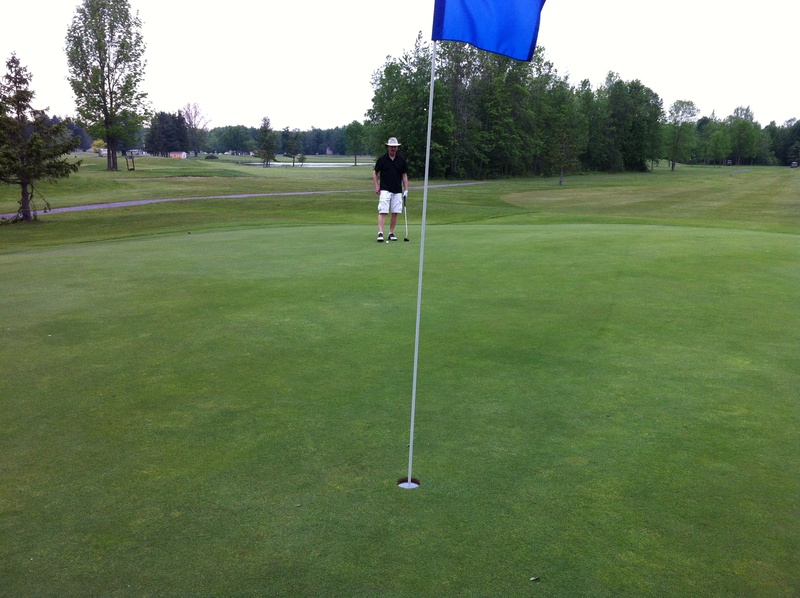 15, when I pitched a sand wedge from about 40 yards left of the green, over the bunker, to watch it roll into the hole. I was playing with Bird. Do not ask me how I did last night, though. I had a fine night with the iPhone 4 camera. Although Bird did kindly tell me that I could easily turn the camera shutter click sound off. I don’t want to, though. I don’t hit the button through their shot. I know golf photo etiquette, I swear. If you’re a golfer, have you ever got an eagle? If you know a golfer, have you ever heard them brag about getting an eagle? If you really know a golfer, did you believe that they really got an eagle? Whoo, lot of avian work there. I know, Paul! I want you to go back again so I can get more fun pictures from you. I tried golf once but that one by the gorilla and the one by the zebra messed up my score so much I never went back. How did you do with the windmill and the clown’s nose, Carl? I know this may come as a shock to you but I feel that I’m too loud for golf. And, it takes too long. Although, I would make an excellent beer girl. Past boyfriends have been golfers and none ever achieved an eagle but I am surprised no one tried to pull one over on my gullible self! I think you would make an excellent beer girl, Skinny Pirates Girl and Moonshine Girl, CBXB. You’d have to keep the voice down while serving them up from the cart … Nah, the golfers would forgive you for delivering the delicious drinks. Oh good that you think the golfers would be forgiving because my voice tends to carry! I will hear it when your reality show hits TV, CBXB! Bird, birdie, eagle? I don’t know this language! I just want to steal your shoes and go swing dancing. They are damn fine looking shoes, Kerbey. I believe you about knowing Golf etiquette. Yes, I have enough years of practice, Rachel! I will like this without having understood a single word. But on the principle that I knew you had fun. Out in the big green golf garden. That is pretty darn fun, indeed, Colleen. wow, things are heating up in the league. i love the pic of bird looking over his eagle putt. i think it’s important you have a team photog, you have an important role, whether you have a good golf day or not. i loved all the flying creatures mentioned here, beginning with your title. I think the team photog may have been a bit distracting to the actual eagle tries last night, Beth. But they got these shots here because of my efforts, so there! Next week, maybe I shall have a birdie putt, and I will hand the phone over to one of them, Beth. Ha! Good point, professional photographer. I didn’t brag…did I? Rough night out for you guys, but I bet it was still fun. Loaded with lots of laughter and conversation, which makes it perfect. No matter the score, Mark. You already told me about your hole-in-one, and you didn’t brag. You were too modest, in fact, Audrey. HEY, AUDREY has a HOLE-IN-ONE! Haha! No need to shout, Mark. People will stare!! I think I would be a great TV golf commentator. I know nothing about golf, Mark, but I liked reading this post, anyway. I’m glad you got to spend time with a disc jockey, Larry Bird, and the symbol of our great country. Lucky me, Ann! A patriotic day with a legend. A top 40 day. I asked the people in my group what they want me to call them in the blog, and they said DJ and Bird, so they are DJ and Bird, Robin. I did not know of the alien Larry Bird, just the former basketball star Larry Bird. I like the golf cart neighborhood angle, though! Thank you, Kim. I try to keep the story lively for all!